Leadership is a way of thinking. It begins in the head of each player with a desire to achieve and a willingness to take responsibility. Coachability is a key to performance breakthrough for individual players and whole teams. The one essential requirement is the willingness to listen and utilise external input and influences. The mindset of a team can be strengthened or weakened by how they assess the challenges awaiting them. This definition of the situation shapes and drives subsequent performance. Winning can change coach, player and team mindset from the positive drive that brought success into a negative weakness that fails to sustain further achievement. 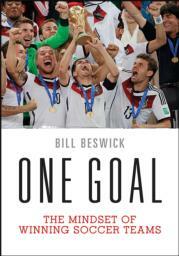 Written by Bill Beswick, renowned performance psychologist and mental skills coach with a wealth of experience for elite teams, including the English Premier League and high-profile teams like Manchester United, One Goal is the definitive guide to developing the mindset of a winning soccer team. It offers proven methods for producing team cohesion, flow, and success.